You know I see a lot of students year to year. Which ones worry me most? And it’s not what you’d think. It’s definitely not the people with no background in finance or business. It’s not even the people who can’t count past twenty without pulling their pants down. Property investing is not rocket science. There’s a few systems to get your head around, but once you know how the pieces fit together, it’straightforwardt forward. I’m not asking you to calculate the angle of a triangle on a moving train. So ‘intellectual’ background just doesn’t come in to it. It doesn’t matter. It’s also not people who have been stuck in an office their whole lives, and can’t tell a hammer from a hack saw. Having some familiarity with the tools of the trade can be great – it can be awesome if you want to get in and manufacture some growth on the cheap. But compared to the money that’s made when you buy well, we’re really just tinkering at the edges. Finally, it’s not the people without a brass razoo to their name. It’s not the people living hand to mouth who have never had more than $1,000 in the bank at any one time. As they say, having money is the easiest way to make money, but if you’re starting with nothing, with a good system behind you, there’s every chance you’ll be fine. No, the people that worry me most are the ‘Comfy Humphreys’. It’s the people who are doing pretty well in life. They’re not super rich, but they’re not poor either. They’re not worried about where they’re next meal is coming from. Generally, these people are just not hungry enough. They don’t have everything riding on their investing success. They’ve got a decent job. They’ve got a fair amount in their super. They’re probably going to be alright, no matter what happens. So hard to get these people going. Even though these people tend to be bright, they also take a long time to get through all the materials I give them. They have other things on. Dinner parties to organise. Kids birthdays to coordinate. They’ll get to it next week. Without a sense of urgency, finances will tend to find their way on to the back-burner. And then when they finally get through all the training, they tend to be incredibly cautious. They don’t like to take risks. They’ve never had to take risks. And so they’ll pass over deal after deal because it’s never ‘exactly’ right. They’ll let hundreds of good deals go through to the keeper before they’re finally compelled to act. Seriously, the Comfy Humphreys are hard work. And how do we work with Comfy Humphreys? What do we do if we’re a Comfy Humphrey ourselves? You’ve got to move their goals away from things like, “it’d be nice to have a bit of extra money” to something that’s really going to light a fire under their bum. Like, being able to take a year off and go travelling with the kids. Or retiring ten years earlier than planned. Or getting their eldest daughter through dentistry school, debt-free. Whatever it is, you’ve got to move them away from vague, hand-wavy goals towards things that are real. Things that inspire them and give them a sense of urgency. Things where the rubber really hits the road. Notice though that I’ve chosen positive things. It might be tempting to try and scare yourself into action. What if the hubby gets cancer? What if global stock markets crash? What if I lose my job and become unemployable? I should really have a buffer. This might inspire action, but it also activates our risk-aversion. We clam up. We’re too scared to put anything on the line. No, it needs to be positive. It needs to be inspiring. It needs to be uplifting. You’ve got to fill your world with vision and imagination. Unless you can do that, the couch is just too comfy for Humphrey. 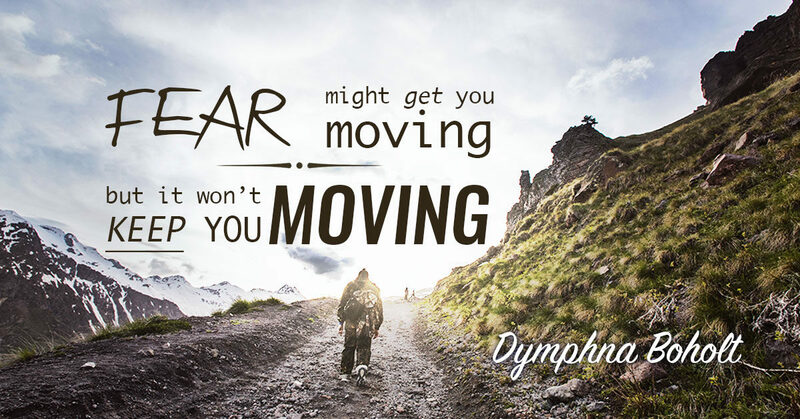 Are you trying to motivate yourself through fear?